 From Pulitzer Prize-winner Johnson (Sleepwalking through History, 1991): a depressing look at America's disintegrating society and the moribund American dream. Johnson traveled throughout the United States for two years, from Maine to California, talking to ordinary people about the direction of American society. Wherever he went, he found people concerned and angry about the same issues: crime; massive, permanent budget deficits; unemployment and underemployment; the declining schools; and the decaying industrial base. 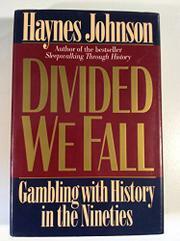 Johnson allows people to tell their truly frightening tales: of college graduates and holders of doctorates unable to find any but unskilled employment; of students who fear random violence in the classroom; of wealthy people living in fortresslike dwellings; of crippling cuts in services such as libraries, schools, and policing; and of cities, filled with economic frustration and racial tension, exploding in riotous rage (most spectacularly, in Los Angeles in 1992). Johnson looks at increasing class polarization, the transformation of American society by huge waves of immigration, the threat of environmental disaster, and the attempts of Americans to restore a sense of purpose and value to their lives. He also examines how unresponsive the American political system is to the nation's many crises and how government is too often hamstrung by marginal groups or special interests. On the other hand, Johnson sees a sense of urgency in the Americans he met. Looking back at other crises Americans overcame, he observes that ``America still possesses enormous resources, backed by an energetic, resourceful people.'' Haynes concludes that Americans can address the challenges facing them, however formidable they may be: he does ``not feel that I have been writing the obituary of the American Dream. I believe I have been writing about an interlude in the reclaiming of that Dream.'' A disturbing snapshot of a nation in crisis, with a critical message: If you love your country, take action.